Click on the image to enlarge the calendar. START DATES: any week, on Monday (except public holidays). ENTRY CRITERIA: Course entry is subject to meeting the placement test criteria. EXAM DATE: FCE 4 Dec / CAE 5 Dec.
Cambridge exam fee (approximately $340 + postage) not included. 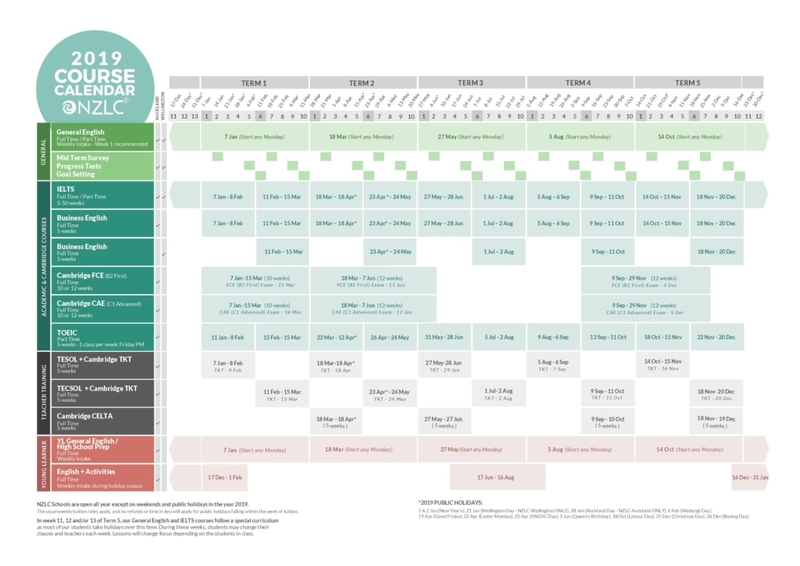 START DATES: Start of Module1, 2 and 2B (IELTS 5 – 30 weeks). IELTS exam fee (approximately $385) not included. Exam by own arrangement. TOEIC exam fee (approximately $300) not included. Exam by own arrangement. COURSE: 18 Mar – 18 Apr 2019. START DATES: Start of Module 1. TESOL exam fee: (TKT 3 modules $280 + postage) not included. Exam arranged by NZLC. START DATES: Start of Module 2 and 2B. TECSOL exam fee: (TKT Young Learner Module $120 + postage) not included. Exam arranged by NZLC. Young Learner General English / High School Preparation (YLGE /HSP). START DATE: Any week, on Monday (except public holidays). Monday to Thursday 9.00 a.m. – 3.15 p.m. and Fridays 9.00 a.m. – 12.15 p.m.
Monday – Friday 9.00 a.m. – 12.15 p.m.
Monday – Thursday 1.15 p.m. – 3.15 p.m.
Monday – Friday 9.00 a.m. – 3.15 p.m.
Students can start any Monday within the above course periods (except public holidays). Minimum 1 week enrolment required. Maximum 5 weeks for English + Activities programme. • Young Learner Courses 13 – 17 years old. Applies to General English, IELTS and Business English. $100 will be charged on the offer letter and $50 will be refunded on return of the textbook in acceptable condition. and that will appear on the first school’s offer letter. $50 will be refunded by the second school. No textbook deposit is required for students joining Young Learner / TOIEC / CELTA. Cambridge Exam Courses (FCE/CAE), TESOL, TECSOL and CELTA. Each student will receive their own textbook to keep. • Groups of any size. – Experienced bilingual coordinators available. • Combine NZLC schools. – English + Activities / High School / University / Teacher Training. • Homestay placement (individual or twin share). The usual weekly tuition rates apply for weeks where the above dates fall. No refunds or time in lieu will apply for public holidays falling within the week of tuition. * Week starting Tuesday or ending Thursday due to public holidays. ** Module 2A – General English and Young Learner GE/HSP. *** Module 2B – IELTS, Business English, TOEIC, TESOL and TECSOL. • For General English, we recommend starting at the beginning of Module 1 as the courses follow a 10-week cycle. However, students entering General English Courses can start on any Monday (except public holidays). • NZLC reserves the right to cancel courses which do not meet our minimum student number. 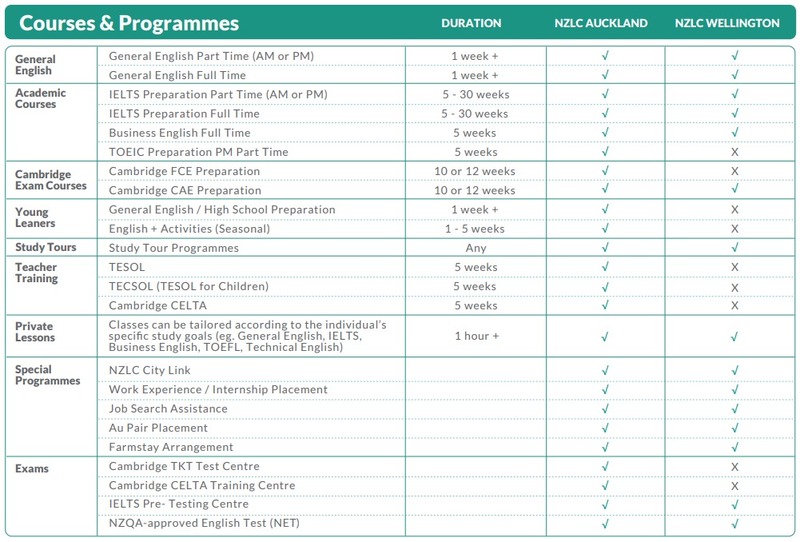 • Timetables may vary in each NZLC school.